In the wake of the September 11 attacks, the Internet provided a virtual public space where grief, fear, anger, patriotism and even hatred could be shared. While the expression posted to the Web in response to the attacks spanned the range of human emotion, this study suggests that foremost among them were expressions of grief and condolence, followed by religious or spiritual expression. And despite the fact that Internet users from many different countries created the expression analyzed in this study, expression of American patriotism still appeared on close to half of the Web sites analyzed. It is clear that for many the Internet afforded an opportunity to users to respond to the crisis personally. For those whose only contact with the attacks came through a television set, the Internet provided a way to connect emotionally with a “virtual community” whose ties were not geographic, but bounded by common experience. Today, this expression serves as a reminder of how a nation in mourning could share the burden of grief and feel the support of Internet users from across the country and around the world. In the 48 hours after the terror attacks on September 11, 2001, Americans turned to the television as their primary source of news and information, according to analysis at the time by the Pew Internet & American Life Project. However, generalized and broad television coverage could not often help individuals with specific questions about missing people. The loss of phone service around Ground Zero and the Pentagon compounded the anxiety of those seeking information about loved ones, pushing them to seek alternatives modes of communication such as email, instant messaging, and later, online registries. In fact, nearly one-third of Internet users reported in the first weeks after the attacks that the Internet “helped them connect with people they needed to reach,” the Pew Internet Project found. At the same time, the Internet served a different communication need by providing a place for people to express themselves. Internet users in America and abroad turned in record numbers to chat rooms, email listservs and message boards to both post comments and read those posted by others. Engaging in these online meetings and chats allowed for the creation of online communities where Americans could “sort out their feelings and hash out their views,” a Pew Internet Project report argued at the time. 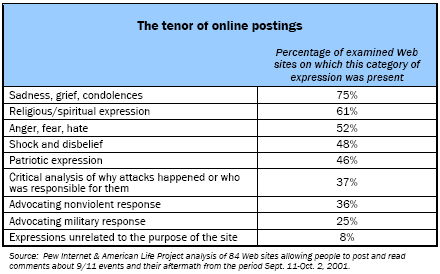 Today, the collection of expression included in the September 11 Web Archive serves as a public record of the how Internet users around the world responded online to the events of September 11, 2001. The primary goal of this report is to describe the variety of expression found in online postings in the first three weeks after the attacks. For the purposes of this study, analysis was limited to textual expression posted publicly to a variety of listservs, blogs, chat rooms, guest books and memorial sites for the three-week period beginning September 11 and ending October 2, 2001. To obtain a sample for this study, 84 Web sites were selected from a larger sample of English-language sites drawn from the September 11th Web Archive. A site was included in the sample for this study if it had the capacity for visitors to post their own expression and/or access the expression of others’ on the Web site. The sites selected represent a broad cross section of the categories of Web sites that supported the ability of visitors to express themselves online, including those produced by individuals, charity or civic organizations, businesses, and governments, as well as those Web sites created for the sole purpose of memorializing the attacks. 1) shock and disbelief; 2) sadness, grief and condolences; 3) religious or spiritual; 4) anger, fear, and hate; 5) patriotic; 6) critical or rational expression, attempting to answer questions such as “why did this happen?” and “who is responsible?”; 7) misuse or abuse of a Web site; 8) advocating a military response or 9) advocating a nonviolent response to the attacks. Each of these categories of expression is described in the following paragraphs and illustrated with examples from the collection of Web sites analyzed. Because multiple impressions of each Web site were analyzed, (one from each of the three weeks as available), it was possible to examine how expression changed over time. This allowed for the observation of how each of the categories of expression appeared with either greater or less frequency in each of the subsequent weeks. Each posting was “counted” in each relevant category. For example, “God bless America,” was counted as an instance of both patriotic and religious/spiritual expression. Due to the limited sample size for certain weeks, data should be interpreted as suggestive of a trend towards either increasing or decreasing frequency of expression, but not definitive. Because this study relies upon sites included in the September 11 Web Archive during the first three weeks after the attacks, it is entirely possible that the forms of expression observed on these archived sites were either much more or less common on live Web sites at the time of the attacks. Expressions of sadness, grief and condolences were the most common on these Web sites. Fully 75% had such comments, followed by spiritual/religious statements, then expressions of shock and disbelief and patriotism. Unlike the other categories of expression, statements about the poster’s grief appeared consistently throughout the time period of this study. Religious or spiritual expression, the second most common subcategory, appeared on over 60% of the Web sites with declining frequency over the three weeks. Included in this category are references to prayer, quotations taken from Biblical texts, and phrases like “God bless you.” While patriotic testimonials and statements about a poster’s initial shock to the attacks appeared on 46% and 48% of Web sites surveyed respectively, patriotic expression is found consistently throughout the three weeks while expressions about the initial shock of the attacks is found increasingly over the period of this study. Analysis of the data also reveals an increasing trend for negative and critical analysis, while advocating a negative response declined over time. Despite appearing on less than 10% of the Web sites in this study, there was consistent evidence of the misuse or abuse of Web sites throughout the time frame. The sections below provide examples of each of these nine forms of expression. Present in nearly 50% of the Web sites analyzed, expressions of initial shock included discussion of the poster’s shock, horror, numbness and incredulity at the attacks. These emotions were expressed not only by Internet users physically close to World Trade Center towers, Pentagon or Pennsylvania sites, but also by Internet users around the world. In the passages below are three different examples of initial expression. Plane crashes in to the word trade center. Apologies for not linking to anything besides the main CNN page but there are no full stories on this yet. The plane crashed into the building about six minutes ago, from what the TV is saying. We are about sixty blocks north and we can see the smoke over the skyline. oops looks like i missed it by a minute. I missed it by two. That doesn’t look good. Just as an FYI, it’s New York City, not Chicago. Even the expression from eyewitnesses seems dispassionate and detached. My entire workplace witnessed the 2nd plane crash. It looks like the first one hit near the top of the building with the anntenna. The second circled around and hit the other building somewhere near the middle. Over time, as the reality of the situation emerges, expression becomes more emotional. Conversations like the one above were quickly replaced by the expression of initial emotions (disbelief, horror, and shock). This testifies to the speed with which information about the attacks was dispersed. I go to Williams and John street everyday for work. I arrived at the WTC N,R station just as I do everyday, headphones on, listening to The Avalanches. It was a beautiful, clear blue , cool pre-fall morning. I felt the sonic boom go right through me, and then heard what sounded like a truck tire blowing out, ringing through the sandwiched buildings downtown, as I have heard many times before. I look up, and I see flames shooting out of the WTC #2, immediately followed by a stream of glass and paper, followed by several large, flaming pieces of projectile steel. It looked like a twisted parade. Shock took over, mixed with adrenaline. I, instinctively, along with everyone around me, ran like hell. I get to my office lobby area, two blocks down, and thousands of pink, white and yellow letter-sized memo papers are just raining to the ground, all 4 edges of each burned away. By far the most common form of expression, statements of grief, sadness and condolence appeared on three-quarters of the Web sites in this study. These kinds of expressions even appeared on the Web sites of governments and corporations, sites usually devoid of any kind of expression. The examples below demonstrate how this subcategory appeared on various Web sites. “My heart is heavy with pain and my eyes fill with tears as I send the families of the victims this messege. I’m a US Marine and wish I could do something to ease your pain. I cannot even imagine how you all feel. My heart goes out to you all. I know in my heart that the people responsible for this action will be found and they will punished, if not by man, than by God. God be with you all. Texas hearts are with you. “I am paralyzed by the horror and sadness of what has happened. It is beyond me to express the sadness and concern I feel for everyone who is suffering today. I am sending healing thoughts and energy out to everyone who cannot help but be changed by this and eventually made stronger in our resolve to stand together against such heinous, inhuman behavior. Reading the expression above, it soon becomes obvious that these emotions are not limited to New Yorkers or even Americans. This online version of emotional support and empathy poured in from around the world. The official government Web sites for Canada and the Isle of Man both supplied an online guest book to allow their citizens to post messages for Americans and others to read. As in this example from Canada’s guest book, these online structures were successful in facilitating interaction among citizens of the world. We are so sorry for your loss. We have shed many a tear this past week. I would like ot send my deepest condolences to the United States of America in the midst of such dark times. If history has shown anything, it is that the USA has bounced back time after time after time, and will do so again, with the help of Canada, the United Kingdom, and the rest of the free world. God Bless America. En mon nom et au nom de mes enfants, j’aimerais exprimer aux parents, amis, collègues de travail des victimes des attentats du 11 septembre 2001 mes plus sincères condoléances. Ayant plusieurs membres de ma famille qui résident aux États-Unis, dont certains sont des citoyens américains à part entière depuis de nombreuses années. En cet instant, la frontière qui nous séparent me semble bien futile, ces gens disparus le 11 septembre sont aussi mes compatriotes. As an American as well as a New Yorker, I would like to thank the great people of Canada and all that they have done after that tragedy which occured last Tuesday…your prayers and support have uplifted us…you truly are great neighbors and friend! We are truly touched….and just saying thank you is not enough…I ask that you pray for all those rescue workers as well as the families of those that are still missing or are dead. Once again..thank you! Appearing on over 60% of the Web sites analyzed, messages with religious or spiritual references included those with prayers, Biblical passages, and general references to God or Allah. While some messages focused on the religious overtones behind the attacks, more frequently the expression in this category suggested God as a sources of healing, referred to prayers made on behalf of those suffering, or asked that “God bless” America, the heroes, the victims and their families. The following quotes are taken from a message board open to the general public and hosted by a Web site dedicated to improving rescue and relief responses to disasters. These excerpts are representative of the religious expression that was present even on Web sites and message boards produced by secular entities. I would like to seen my utmost condolences out to the family, and friends of the victims of this terrible tragedy. Remember look towards God. That is where true strength snd comfort come from. I would like to let all of the friends and family of the the victims know that my prayers are with you. Many of my friends are also praying. My heart is broken for all the pain and suffering this evil event has caused. But our God is a big God. You will see our country unified as never before. You will have help and support like you never thought possible. This country will and is rallying behind you and will for a long time to come. May God give you the strength and courage you need in the days to come. May He provide for ALL of your needs for you and your families. These types of expression are present on just over half of the Web sites surveyed. Though somewhat similar to statements about shock and disbelief, expression of anger, fear and hate appeared on Web sites in vastly different forms ranging from anger towards the terrorists and fear of more attacks to fear of discrimination and hate crimes against Arab Americans or Muslims. In addition, these kinds of expressions were also directed at Americans and other Internet users who posted unpopular or controversial proclamations on the Internet. In this example from a personal Web log, or blog, the author describes his experience with the new climate of racial tension after the attacks. Notably, after posting this story, he received over 250 responses from site visitors, which offers some indication of how large an audience some expression on the Internet reached. I was doing better today, until a short while ago when I was at a cafe for breakfast. As I stood in line, someone (very loudly and in a very accusing tone) asked: “Are you from Afghanistan? ?” All eyes turned upon me, burning, each one accompanied with accusatory frowns. Needless to say, I very sheepishly said: “I am not from Afghanistan.”, then I quietly left … with an empty stomach and almost crying. I felt so small and I now feel so unsafe and uncomfortable. In the next example, from a Web site dedicated to “uncovering media myths about the Middle East,” the site producer has posted a letter to the public expressing apprehension, fear and gratitude over the messages sent to him since September 11. Here, anger, fear and hate are present in both the author’s expression and several other examples that the author has excerpted from messages he received. It is extremely hard to write this morning, and yet I feel I have to. Everything hurts so much. After a few hours sleep, I woke up in the dark, hoping and praying that I had woken up from a nightmare. The nightmare is still there. Today, as dawn breaks over New York City and the country, we will start to come face to face with the enormous tragedy and crime that struck yesterday, and we will begin to learn of countless thousands of families whose loved ones have been ripped from them. They have will have names and faces. It is beyond imagination and comprehension…I hope too that Americans will maintain their humanity and not surrender to their basest feelings as understandable anger, frustration and grief rise. Arabs and Muslims in America now live with real fear and apprehension. From early yesterday morning, I began receiving to my website, as well as to the email of the Arab American Action Network messages that only deepened the pain of the day. “Pay back time…will come soon,” was the simple message from REise99@aol.com. As the emotional fervor after the attacks subsided, less emotional and more analytical material began to appear. The willingness of Internet users to share their views on the reasons for the attacks and the motives of the attacks also increased over time and the number of statements advocating U.S. military reprisals diminished somewhat. Overall, expression advocating a nonviolent U.S. response or self-restraint appeared on 35% of the Web sites. Comments advocating a military response or vengeance appeared on 25% of the sites. Statements discussing the reasons for the attack appeared steadily after the first few days and overall were found on nearly 40% of the Web sites. Examples from each of these three categories are below. Expression advocating immediate military action or revenge for the attacks often focused on Osama bin Laden and his supporters as primary targets. Other times, messages urged violence against Muslims or Afghanistan as a whole. In contrast, other messages advocating a nonviolent response stressed the need for America not to lash out blindly at innocent people. Frequently, as in this example, messages supporting these oppositional responses to the 9/11 attacks are often found near each other on message boards. I AM A LEBANESE CATHOLIC AMERICAN AND I FEEL THAT PALESTINIAN MUSLIMS SHOULD BE GATHERED UP AND FREAKIN SHOT. THEY MAKE THE MIDDLE EAST LOOK LIKE AN ANIMAL HABITAT. I HAVE LOST A FAMILY MEMBER AND A GREAT PERSON IN THIS HORRIFIC ACT OF DISGUST. PLEASE DO NOT LUMP THE LEBANESE AMERICANS WITH THESE BARBARIANS THAT DARE CALL THEMSELVES HOLY!!! We should not harbor any ill feelings toward Muslim Americans. We all live in this great country for a reason. Race should not become an issue EVER. “God bless America” or “United We Stand” and as the primary subject of expression. The following example, taken from a Web site created for the purpose of memorializing the World Trade Center and Pentagon attacks, shows how of patriotism appeared in expression on the Web. This past week, evertime I have come across an American flag, it has brought tears to my eyes. Tears of sorrow, anger, but mostly patriotism. I love this country. Always have the entire 18 years of my life. Despite all the critisism that America has received in the past, both from afar and within, the world remains in total shock, for America, the home of the proud and the free, has been violently struck at this past week. I think of it as a flesh wound. Sure, it looks bad presently; it hurts, stings, makes you want to cry. But it will eventually heal, leaving a scar as a remebrance, for we can never forget this tragedy.The terrorists this past week, and anyone out there who dares to attack America must know that you can’t destroy the her heart; it has been wounded, but with the spirit of America pumping though it, it will never perish. The final category of expression, the misuse and/or abuse of Web sites, appeared on less than 10% of the Web sites analyzed in this study. This subtype refers to expression that is either inappropriate to the context or purpose of a Web site or abuses the privilege provided by site producers by ignoring their intent for allowing public expression on the Web. Examples include entering false identities into victim’s registries or trying to solicit business on memorial message boards among others. Both obvious and subtle forms of abuse and misuse provide information about how some Internet users took advantage of this sudden opportunity to create expression. However, it is impossible to know how much attempted abuse or misuse was stopped by site producers who removed inappropriate expression before it reached the public. These later postings refer both to relevant (Osama) and irrelevant (Greenpeace) parties and some may find the content of these messages objectionable. However, it is the context in which this expression is found, on a memorial Web site, which makes it abuse/misuse and not the content of the expression in general. A final example of misuse found on the message boards of the Disaster Center, similarly involves the posting of expression inappropriate to the context. This time, while the content of the message, a family seeking loved ones, may not be objectionable, it is nonetheless inappropriate to the context of a message board on which it was posted. Our prayers go out to the victims and their families. We must come together as a nation to defend our freedom. We MUST pray for our leaders at this time. They need wisdom and guidance in what they are preparing to do.